I would not classify the monstrous bombing of the Boston Marathon as "terrorism" in that there doesn't seem to be a political goal or any attempt at manipulation through fear. On the surface it seems an insane tragedy wrought by a young man twisted by his upbringing in a war zone and his influence on a younger brother. But nothing occurs in a vacuum. This documentary can be ordered free. The subject is one I recently wrote about in my regular column for a local magazine. Beyond writing, I am an activist. I have been active in issues ranging from work against racism and apartheid to anti-war protests, labor solidarity, issues of human rights, economic justice, and civil liberties going back to the 1970's. That said, in many ways these are increasingly troubled times. As someone who pays attention to the news; who searches beyond the U.S. and mainstream media to stay informed, I find a the news increasingly disturbing as of late. Not the news you hear about, superficial as that often is, but the news you increasingly do not hear about as real journalism is replaced by shallow tabloid reporting. Examples include the sentencing of former CIA officer John Kiriakou to 30 months in prison for revealing in 2007 interviews that that Abu Zubaydah and other terrorism suspects were being waterboarded. None of the people who ordered or engaged in torture, people like Donald Rumsfeld, have been charged with war crimes or human rights violations. Julian Assange remains holed up in the Ecuadoran embassy in London fearing extradition to the US for his exposure of sensitive information via Wikileaks that the official press ignored. More recently, Aaron Schwartz, a cyber-activist who brought us the creative-commons and worked tirelessly for an open internet and freedom of information committed suicide because of government harassment and the possibility of a 30 year sentence. His crime? He attempted to make public scientific journal articles which were accessible at M.I.T. The university chose not to press charges and opened the information to the public after Mr. Schwartz returned it. The US Sentencing Commission, acting on behalf of the Obama Administration, insisted on prosecuting Schwartz as part of a crackdown on cyber-activism. It is part of a disturbing pattern. But there is much more going on here; corporations, most recently Trans-Canada are bringing crushingly expensive lawsuits against activists using what is called a Strategic Lawsuit Against Public Participation. While some jurisdictions have made such suits illegal, they remain a big threat, as activists opposing the XL Tar sands pipeline have discovered. As usual, the infamous corporate front, the “American Legislative Exchange Counsel” or ALEC plays a big role. They recently helped expand the never-ending “War on Terror” to include citizen activists and investigative journalists with the “Animal and Ecological Terror Act” designed to protect agri-business and the fossil fuel industry against the dangers of public exposure and citizen resistance. The Act defines an “animal or ecological terrorist organization” as “two or more persons with the primary or incidental purpose of supporting any politically motivated activity intended to obstruct, impede or deter any person from participating in a lawful animal activity” or in “mining, foresting, harvesting, gathering, or processing natural resources.” This and other passages in the Act could be used to prosecute and label as “terrorists,” mainstream environmental groups engaged in nonviolent advocacy work as well as whistleblowers and investigative journalists. In addition, the ALEC legislation creates a “terrorist registry” managed by each state’s Attorney General to list anyone pleading guilty to or convicted of “animal and ecological terrorism.” Interestingly, a few years back a Freedom of Information release showed that in our area the focus of FBI surveillance was on the Catholic Worker for their antiwar activism and on PETA. These lovers of peace and of animals are the “terrorists” among us? We are now living with the most intrusive government we as Americans have ever experienced. Our emails and cell phone communications are increasingly monitored and, outside of a few places like Rolling Stone, New Yorker Magazine, and alternative news venues, investigative journalism has all but vanished, replaced by shallow human interest stories and outright propaganda. The confirmation hearings for John Brennan, President Obama's choice to head the CIA has brought to light the President's expansion of Executive power to include assassination, even of US citizens, without oversight as well as the increasing use of drones. John Brennan is the architect of the drone program and Obama's decision to put him at the head of the CIA is both disappointing and telling as is his echoing of John Yoo's defense of executive power expansion to include torture. Hedges is right and We the People have to push back. We have no choice. We must demand a roll back of Executive power, the repeal of the National Defense Authorization Act and the Authorization to Use Military Force. United we have the power to defeat the tyranny of an increasingly corporatized police state and demand real representative democracy. Even if we were to assume that the basis for a “War on Terror” were originally sound, the corporate coup has turned it against us to crush any resistance to its agenda of insane avarice. It's not about an out of sight them anymore or about defending our shores or our way of life. The War on Terror has come home and increasingly its about you. Suggested donation: $5-20, no one turned away for lack of funds. Free childcare provided upon request. Please contact michaelware1205@gmail.com to reserve or for more info. Registration opens at 9:30am. Opening plenary at 10am followed by three workshop sessions and a closing plenary from 6-7:30pm. Post-conference dinner and drinks (unfortunately not included) immediately afterward. 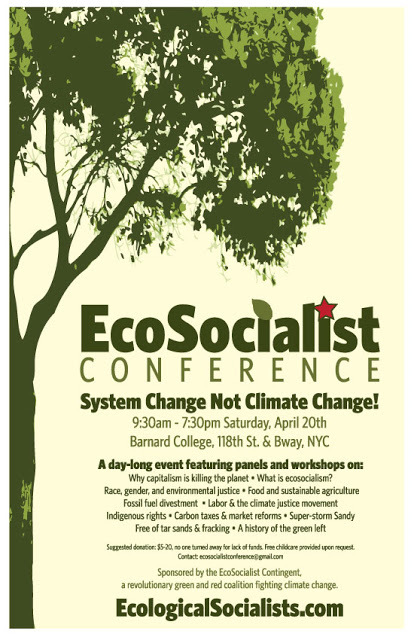 Hosted by the Ecosocialist Contingent, a new and hopefully growing alliance of socialist and progressive organizations and activists who understand that the climate crisis cannot be addressed without overcoming the main cause and obstacle -- capitalism.